The financial reports presented in the Shores News represent a new 2011 YEAR END report (click here for list of reports). It contains four basic sections: Revenues, Operating Expenses, Other Expenses and Cash Position for the year. The Revenues and Operating Expense sections have been published previously. The section on Other Expenses needs a little explanation: These are legitimate Association expenses that are reported in the financial reports and not on the old income/expense reports with which you are familiar. Al rubosky, Gary Stamm and I thought it would be very helpful if these were reported to the membership. In addition, a brief statement of the Association’s cash position is reported on the bottom of the page. The Cash on Hand as of January 1,2011 (residual from 2010) was $3313. The gain in Cash during 2011, after all expenses were paid, was $26,260. Adding the two numbers results in the Cash on Hand as of December 31, 2011. This is commonly referred to as the RESIDUAL. If you have any questions or comments about this report, you can contact me at the office by phone or email. The Treasurer’s Report and a summary of our accountant’s report are also included. The winner of the third early bird contest for 2012 and recipient of $400 is Tim Mizer (Lot 1133)! 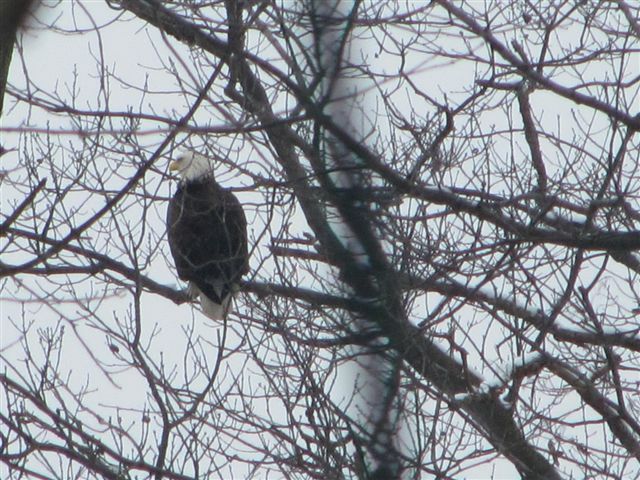 These pictures were taken in the Plum Creek area on Saturday, January 14th by Mike Zook. 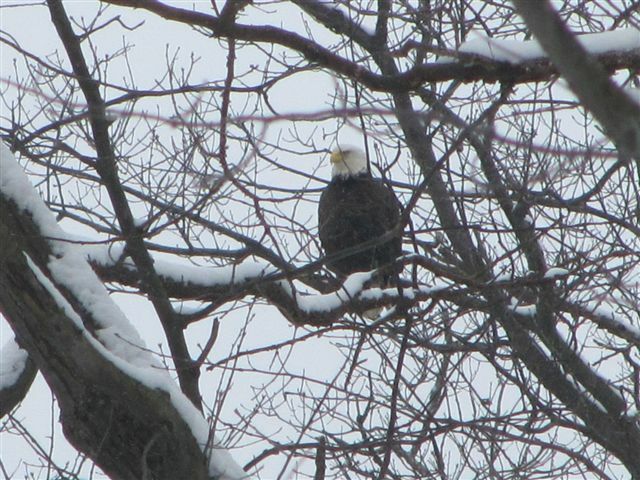 It seems not even the cold can keep the Eagles from enjoying the lake! The winners of the second early bird contest for 2012 and recipient of $450 are Lisa & William Nelson (Lot 2058)! The winner of the first early bird contest for 2012 and recipient of $500 is Del Christofferson (Lot 2205)! There will be a public meeting regarding utility rate adjustments scheduled to be held at the Village Hall on Monday, February 27, 2012 at 7:00 p.m. Parking on the roads and/or berms on Association Owned roadways is prohibited when the snow dept exceeds 2″ (two inches). This is necessary in order to facilitate the plowing and/or removal of snow. The schedule of penalties for the above infraction(s) are the same as those in place for violation of the rules and regulations. Under extreme or emergency conditions, the vehicle(s) will be towed at the owner’s expense. The snow is coming. Residents should make sure their mail boxes and posts are secure enough to withstand the winter snow plowing at this time. Our drivers are highly experienced and our policy is to only repair the boxes we strike, not those simply pushed aside by the snow itself. Also, please remove all vehicles, boat trailers, basketball stands, etc. from the RRA right-of-ways. Remember, the RSV has a regulation against plowing snow out into or across the roadways.